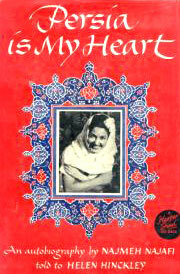 Persia is My Heart, published by Harper in 1953. The autobiography of Najmeh Najafi as told to Helen Hinckley. The story of a dress designer from Iran who tells the story of her life as it parallels the emergence of Iran into the modern world.